The vast majority of 5-a-side players don’t put much effort into doing a pre-game warm-up at all. The fact is, if your warm up sounds like this, you’re doing it wrong. That’s a risk you don’t want to take. 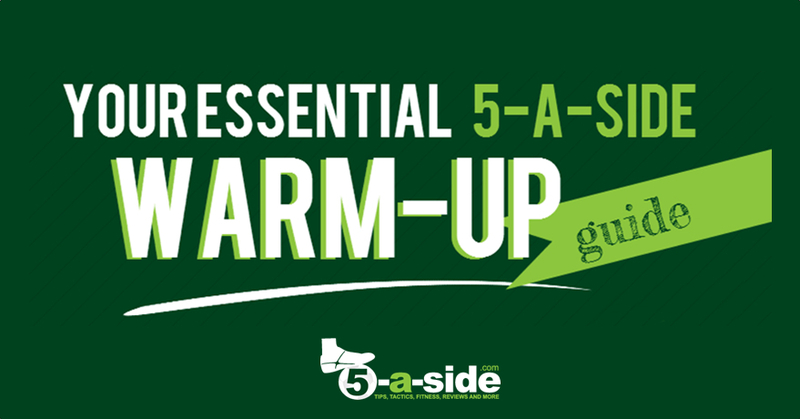 Playing 5-a-side without performing a warm-up is going to significantly increase your chances of getting injured and ultimately reduce your playing time. Why warm up for 5-a-side? Prepares your body for exercise – gradually raising your heart rate to the required level so that your first sprint after the ball isn’t such a shock to the system. Mentally prepares you for the game – it gives you a chance to focus on the game ahead and ensure that you’re mentally ready. See our article on warming up your mind for football, for more on this essential aspect. Increases power, agility and performance – by getting the muscles warm and also by refreshing the link between brain and body, you’re fully prepared to perform to your best. Times have moved on. The classic warm-up, which 10 years ago consisted of some jogging followed by some static stretching, is rapidly being consigned to history. Sports science is now telling us that a warm up need not consist of any static stretching at all. A static stretch, in case you were wondering, is a stretch that you do whilst you’re at rest. Static stretches were the core of the old-school warm-ups where you’d all stand around in a circle following somebody who would generally make up the stretches as he went along. Research now seems to be showing that this type of static stretching makes you slower, and may actually increase your risk of injury. Instead, dynamic stretches have taken over as the focus of a warm up routine. You might be unfamiliar with these sorts of stretches, but they essentially involve stretching whilst performing gentle movements. What specific warm up exercises should I do? There are lots of different ways to warm-up, one of the very best is using the exercises that have been supplied by FIFA’s own sport’s science department, which is contained in a programme it calls the 11+. These are really straightforward exercises that are easily explained and can be performed easily by an individual before a game, and besides, some serious expertise has gone into putting this plan together – so it makes a lot of sense to use it.. The routine consists of jogging, interspersed with movements that stretch specific muscle groups. Over the course of 9 exercises the intensity of the warm-up increases so that you are fully prepared and ready to unleash by the time kick-off comes around. It’s really important that you perform these exercises with correct form – which means having your body in line and not allowing your knees to buckle. If you have any doubts on how to perform any of the exercises, it’s worth watching the videos on the FIFA 11+ website (they have provided tonnes of information free to share under Creative Commons license). As you go through the warm-up, make sure that you stay nice and light on your toes – don’t strain anything. There really is nothing more frustrating than injuring yourself before you have even kicked a ball. DO make sure that you leave enough time to warm-up before the game. Too many warm-ups consist of little more than sprinting from the car to the pitch because you left the house too late. So arrive at the venue in advance of kick-off and if the pitch is full, warm-up by the side. DO NOT start smashing the ball around before warming up, tempting as it is. This accounts for a huge number of injuries where people have pulled hamstrings or twisted ankles because they have overdone it with the ball before warming up first. In our warm-up plan the ball work doesn’t start until you are warmed up. DO make the routine fit you – if you need to do more of any particular exercise then do it. However, watch out when adding static stretches and never do the one where you try to touch your toes from a standing position (it’s an injury waiting to happen). DO NOT perform any stretches to the point of pain and do not hold your breath when stretching. Listen to your body; stop if it hurts. To get an extra edge…. No, it’s nothing to do with performance enhancing substances. It’s all about warming up your mind for football – it’s the often neglected secret weapon in the amateur player’s arsenal. Professionals understand that you need to get your body as well as your mind right for football, and it will help you too. Here’s how to get into the zone: How to warm-up your mind for football. Did you find this article useful? Have you got any warm-up tips you want to share? Let us know in the comments below. Credit goes to the FIFA 11+ progamme for putting together an accessible warm-up routine that can be used by all players. This workout has been put together by sports science specialists and has been made available to the public under creative commons . Since it’s so good we have unashamedly based our warm-up plan around it. Credit also goes to the GIF used above for the bad example of the warm up. You can see the full video on YouTube here. Going to try these warm ups- I’m ok playing 90 mins but 5 aside tournaments keep injuring me. 5 aside tournament in Belgium soon involving 17 countries so need to stay injury free. I started Walking Football 10 days ago, aged 68 – haven’t touched a ball for about 35 years. Thought it would be a ‘walk in the park’. Wrong. The main walking is done when someone gets knackered. Other than that it’s pretty full on, especially the 50 year olds. They make a little allowance for the 80 year olds but not much! Week one, I could barely put one foot in front of the other for 5 days afterwards. Week two, last night, thought I’d warm up at home by jogging up and down the hallway. Pulled a thigh muscle. Played nevertheless. but could barly walk off the pitch at the end. Surprisingly, this morning, I am remarkably agile, apart from the thigh which is a little weak. Group warm-ups so far have been exactly as you describe. So I decided I need a proper warm up in future and stumbled across this article – many thanks for it. Gonna try to learn it by heart by next week. Provided the thigh is better I expect everyone else to simply look on in amazement! Hi Bob, so glad that you’ve started walking football and that it has got you back into it! I’ve heard great things about walking football. I hope that you tried the dynamic warm up and that your teammates looked on with a suitable amount of amazement / fear! Personally, I’ve found that the dynamic warm up works really well for me, much better than static stretches, although it does require you to get there early and have the self-discipline to take yourself off for a couple of minutes rather than joyously smashing the ball at the goalkeeper! Definitely something I need to do. Played a game couple weeks ago. No warm up. Pulled my back on first sprint. I was in agony. We had no subs so tried to play on but just couldn’t. The other team proceeded to batter the remaining 4 lads. Ha ha. By the way I deleted my twitter if you were looking for me on there. Too much negativity. That’s such a familiar story haha. Happens to so many of us as we get older. It just seems to take that bit longer to get the creaky old body into gear! Sorry to hear about the twitter – I’ll have to message you on Facebook instead. Just re-read this article as guess what? Did exactly the same thing again a couple weeks ago. I think I told you about it on my new Twitter account. But can’t remember. The thing is the injury seems to have lingered around this time. Haven’t played since.